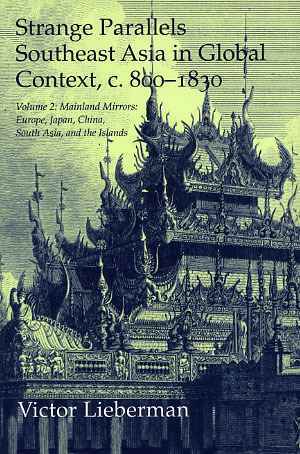 Eight years ago, I had the privilege to review the first volume of Victor Lieberman’s monumental work on the medieval and early modern history of Southeast Asia in global context. Since then this extraordinary book has stimulated debate among historians of Southeast Asia and beyond; it has been widely praised as a masterpiece that has “become a landmark not only in the study of Southeast Asia but also in the study of the modern world” (Li Tana, Australian National University). The first volume (published in 2003) offered a unique re-interpretation of the history of the Southeast Asian mainland by drawing several stunning structural comparisons between Burma (“Western Mainland”) and France as well as between Siam/Cambodia (“Central Mainland”) and Russia. Refuting Anthony Reid’s Age of Commerce thesis, Lieberman persuasively argues that with regard to “political strategy, chronology, and trajectory”, mainland Southeast Asia in the millennium between c. 800 and 1830 shared more similarities with other parts of the “Eurasian protected zone”, such as Europe and Japan, than with the Southeast Asian archipelago. The latter is seen more closely linked to the historical experiences of the Eurasian heartland – China, India, West Asia – which Liebermann calls the “exposed zone” as it had been directly subjected to Inner Asian nomadic conquest elites since the beginning of the second millennium AD. It took Lieberman six years to substantiate and elucidate his main theses about the positioning of mainland Southeast Asian history in a wider Eurasian perspective in Volume 2, entitled “Mainland Mirrors: Europe, Japan, China, South Asia, and the Islands.” The result is overwhelming, not only in view of the volume’s sheer size of almost 950 pages, but also with respect to the richness of detail and clarity of thought. The volume is divided into seven chapters of roughly equal length (each ranging between 110 and 150 pages). In the first chapter the author gives a résumé of Volume 1 and explicates the dynamics of political integration and trajectories of disintegration in the two different zones – “protected” versus “exposed” – of the Eurasian continent. This long introductory part is followed by two chapters on state formation in Europe with focus on Russia and France. Chapter 4 deals with the island state of Japan at the eastern end of the Eurasian “protected zone”. The next two chapters deal with “integration under expanding Inner Asian influence”, China and South Asia serving as case studies. The seventh and last chapter finally discusses developments in insular Southeast Asia. Here Lieberman argues that the early arrival of the Europeans, in the 16th century, had a long-term effect similar to the conquest of China, India and the Middle East by Turkic and other Central Asian nomads; “‘white Inner Asians’ in [insular] Southeast Asia filled a role analogous to that of Manchus and Mughals in their respective spheres” (p. 894). Lieberman’s “Eurasian thesis” makes a number of claims about parallel developments. Firstly, all the disparate Eurasian regions under study – apart from China and India – experienced the emergence of “charter polities” or “secondary states” based on the import of writing systems, legal and administrative concepts, and world religions during the period c. 800–1250. “Much as Dai Viet grew out of the collapse of the Tang empire, the Frankish kingdom developed indirectly from Rome. By contrast, Kiev and ritsuryo Japan – like Pagan and Angkor – had never incorporated a distant empire. The latter four societies owed their civilizing impulse not to imperial conquest but to commercial, diplomatic, or military contacts with external powers, in the case of Kiew with Byzantium, in the case of Japan with Tang China and Korea, in the case of Pagan and Angkor with India and Sri Lanka” (p. 53). Secondly, all charter polities collapsed in the thirteenth and fourteenth centuries giving rise to a new cycle of territorial consolidation between the mid-fifteenth to mid-sixteenth centuries. Thirdly, in each region we observe a substantial and continuous reduction of independent political units until the early 19th century, with outlying zones “assimilated to the status of home provinces” (p. 897). Fourthly, the intensified administrative and cultural integration brought about quite similar phenomena of what Lieberman calls “politicized ethnicity” thus bridging the alleged divide between the “modern” concept of European nationalism and “pre-modern” political allegiance elsewhere. Fifthly, cycles of political integration and collapse closely collerate with climatic and demographic changes. Sixthly, economic and demographic expansion, along with military and technological innovations, also favored cultural circulation. Finally, whereas the Eurasian “exposed zone”, notably China and South Asia, were ruled by conquest elites (Manchu, Afghans, Persians, Dutch, Iberian, etc. ), “capital elites in all six realms [of the ‘protected zone’] embraced the same ethnicity and religion as the majority of their subjects and vigorously sought to disseminate those identities among outlying populations” (p. 900). Lieberman has achieved a lot in his two-volume study of parallel histories on the Eurasian continent. One reviewer even calls it “perhaps the most ambitious and wide-ranging work of comparative history since Plutarch”. Nevertheless, this magnificent work is not without shortcomings. One weakness is Lieberman’s excessive love for detail as a result of which the main thread occasionally gets lost. Another critique pertains to the choice of areas to be compared. Lieberman selects France and Russia as case studies for the European experience basically due to the sophistication of their historiographies. This argument is not fully convincing as the histories of, for example, Sweden and Spain or Austria-Hungary and Poland-Lithuania are certainly not less well researched than those of France and Russia. However, the construction of a political chronology with Southeast Asian realms would have encountered more difficulties as the author implicitly confesses (p. 49). Moreover, Lieberman is occasionally prone to simplifying analogies forcing them to fit his preconceived scheme. A comparison of invasions by Inner Asian nomadic peoples in the Eurasian heartland with Tai migrations to mainland Southeast Asia (for example p. 370 and p. 686) is problematic, at least, as the social organization and material culture of Tai wet-rice cultivators were very different from those of the Turkic or Tartar tribes of Central Asia. Other simplifications – especially those concerning a lack of caution in interpreting doubtful demographic data – could be cited as well. The most significant limitation of Lieberman’s work, however, is its preoccupation with the formation, development and organization of states. Phenomena related, for instance, to ethno-history are, though not completely excluded, definitely of minor relevance. Therefore, a number of interesting and potentially fruitful comparisons are not made a subject of discussion. The north-south movement of the Vietnamese people (nam-tiến) from the eleventh to the mid-eighteenth century, for example, almost inevitably enforces a comparison with the German Ostsiedlung (medieval eastward migration and settlement of Germans). The difficulty to squeeze the Holy Roman Empire into his pattern of political integration in Eurasia may explain that German and central European history is largely absent in Lieberman’s analyses. These reservations aside, both volumes of Strange Parallels constitute a major achievement in the study of medieval and early modern Southeast Asia as well as of world history prior to the beginning of European colonial rule in mainland Southeast Asia. Furthermore, Lieberman’s pioneering work has already opened new windows on comparative history and will certainly continue to do so in the future. Volker Grabowsky: Rezension zu: Lieberman, Victor: Strange Parallels. Southeast Asia in Global Context, c. 800-1830. Vol. 1: Integration on the Mainland. Cambridge 2003, in: H-Soz-u-Kult, 13.01.2005, <http://hsozkult.geschichte.hu-berlin.de/rezensionen/2005-1-030> (27.12.2012). Frontmatter, Victor Lieberman, Strange Parallels. Southeast Asia in Global Context, c. 800-1830. Vol. 1: Integration on the Mainland. Cambridge 2003. Anthony Reid, Southeast Asia in the Age of Commerce, 2 Vols., New Haven u.a. 1988 u. 1993. Andre Wink. Review of Lieberman, Victor, Strange Parallels: Southeast Asia in Global Context, c. 800-1830, vol. 2, Mainland Mirrors: Europe, Japan, China, South Asia, and the Islands. H-Asia, H-Net Reviews. October, 2010. <http://www.h-net.org/reviews/showrev.php?id=31069> (27.12.2013). Volker Grabowsky: Rezension zu: Lieberman, Victor: Strange Parallels: Southeast Asia in Global Context, c.800-1830. Volume 2: Mainland Mirrors: Europe, Japan, China, South Asia, and the Islands. Cambridge 2009 , in: H-Soz-Kult, 13.02.2013, <www.hsozkult.de/publicationreview/id/rezbuecher-15301>.